Many people nowadays lead active, fast-paced lives. When you work at a demanding job or engage in an intense hobby in your spare time, the shoes you choose to wear dictate your comfort level and overall quality of life. Due to this, you need to make sure that what you pick is in line with your necessities. Whether you need the most comfortable boots for standing all day, or you are in the market for a specialized pair of sports footwear to sustain your physical activities, choosing the right pair makes all the difference in the world. 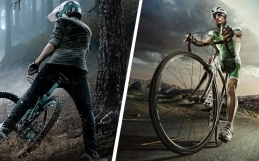 And it’s not different when it comes to mountain biking. 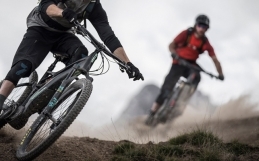 Picking the best mountain bike shoes for your long Enduro Trips won’t only require a cool look :) but also safety, comfort, and efficiency to enjoy all types of terrain. Clip or Not To Clip ? 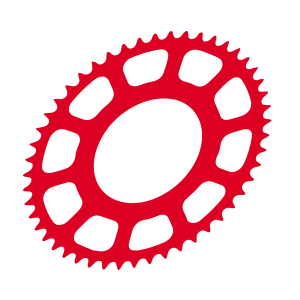 The efficiency of your MTB boots is determined by their compatibility with the pedalling system the bicycle has. There are two main types, namely flat and clipless. On the one hand, the former makes use of a platform to support the foot, and they are usually made from aluminium. The grip is increased through a series of special pins. On the other hand, the latter has a special cleat that latches onto the rider’s shoe. This means that you will need a specific type of footwear for it. By comparison, flat pedal mountain bike shoes are less pretentious when it comes to footwear. Depending on the terrain and weather conditions, both will have their advantages and disadvantages in terms of efficiency. 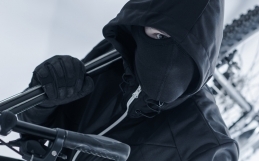 However, the most important factor determining your choice here will be the safety. 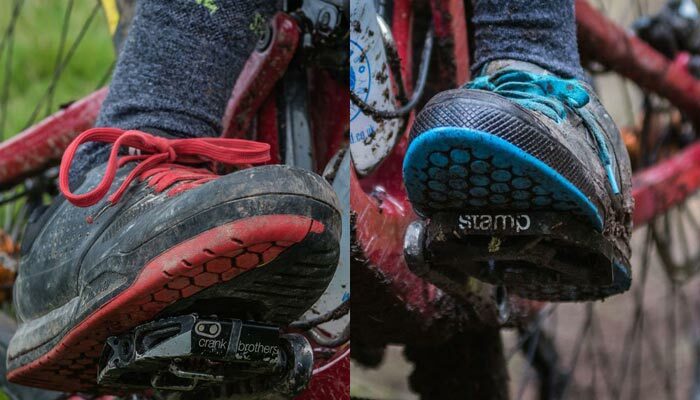 Although today’s clipless pedals are considerably safer than their predecessors, the freedom and ability to instantly remove your foot from a flat type pedal makes it much safer option for less experienced riders. Some people will argue that clipless pedals will make your mountain bike shoes less slippery in wet and muddy conditions. It might be true and of benefit for an experienced trail shredder, but beginners will be much safer with platform pedals in my opinion. 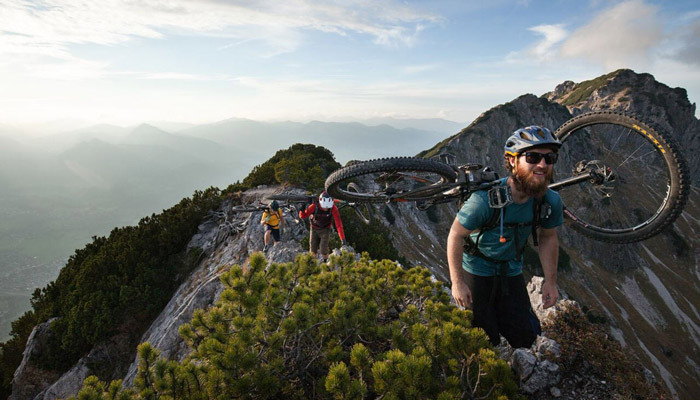 Your mountain biking trips don’t consist of riding only. The amount of time you will need to spend of your bike saddle during your all-day enduro trips is something to consider as well. We often like to hike for hours with the bike on our backs, seeking out epic descents, or you might simply want to stretch your back while walking. Paths and terrain conditions will vary, so we need to make sure the sole unit is not only grippy enough for muddy hikes, but our boots are up to the challenge and don’t wear out your feet or themselves too soon. So comfort and quality of the material will make here all the difference. Tip: Watch for stiffness. 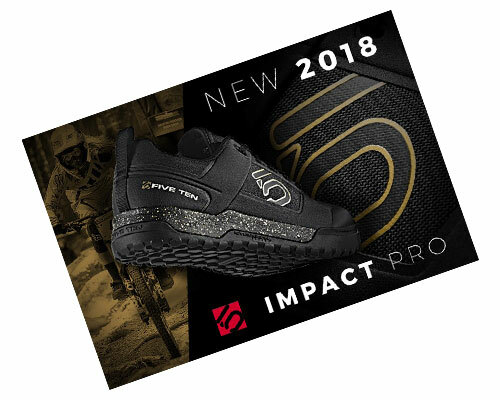 As much as stiff shoes can make your mountain bike trip more efficient from the riding point of view, too stiff will make the shoe a nightmare to walk in. Make sure that there are no stiff parts that dig into your feet. Same as with carbon frames and wheels, stiff can be good or bad. As much as increased stiffness can efficiently transfer your leg power to the pedals, the too stiff sole will be uncomfortable off the bike and lack sensitivity for more creative riding, it’s a little bit like free running in ski boots. 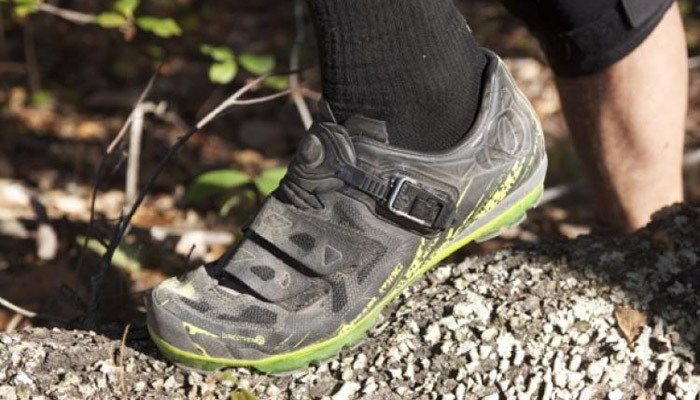 During long day enduro trips, your feet will love a little more flexibility. Tip: Choose something with enough toe space, and some wiggle room on the heel so that maximum flexibility is achieved. 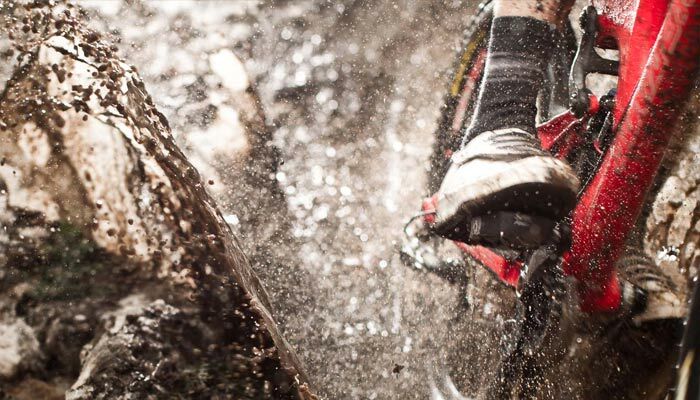 The final thing to look for in MTB footwear is proper waterproofing. There’s nothing worse than putting on sopping wet shoes on. When you’re out on the trail, the weather can be unpredictable, and even when the sun is shining, the deep dark forest will hide some leftover puddles from days prior. The best mountain bike shoes for long day enduro trips should only absorb the minimal amount of water and should dry fast. Choosing boots with a waterproof lining is the best thing you can do. Fortunately, there are plenty of options on the market, so you won’t have too hard of a time picking something out.